Sri Lanka participated at the SIAL Canada 2018 - Food and Beverage Sector International Exhibition, which is one of world’s most popular professional food and beverage sector exhibitions. SIAL Canada is visited by several thousand buyers, buying agents, importers, food sector distributors, experts, wholesalers and retailers. SIAL Canada is annually held alternatively in Toronto and Montreal and this year it was held in Montreal from 2 to 4 May 2018 at the Palais des Congrès de Montréal. 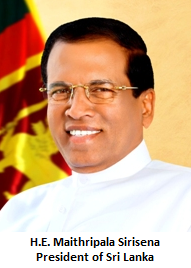 Sri Lanka’s national participation was coordinated by the High Commission in Ottawa and the Consulate General in Toronto together with Canada’s Trade Facilitation Office (TFO), Sri Lanka Export Development Board, Sri Lanka Tea Board (SLTB), Ministry of Foreign Affairs and other relevant agencies. 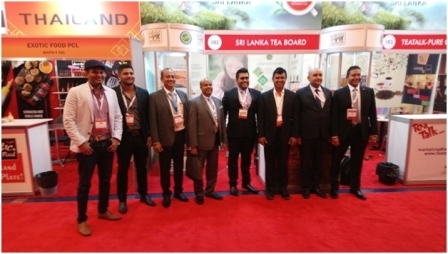 Sri Lanka was represented at SIAL Canada 2018, by the Sri Lanka Tea Board (SLTB) together with Mlesna Tea, Imperial Tea Exporters Pvt. Ltd, Tea Talk Pure Ceylon Tea and Regency Tea. Hero Nature Products Pvt. Ltd also participated at this exhibition under the Market Access and Capacity Building Programme facilitated by TFO, Canada. Value added Ceylon Tea was displayed by Mlesna Tea and Imperial Tea Exporters Pvt. Ltd at this exhibition. Tea Talk Pure Ceylon Tea and Regency Tea, in addition to value added Ceylon Tea, also showcased essential oils and virgin coconut oil. Hero Nature Products Pvt. Ltd displayed coconut products; virgin coconut oil, and coconut milk powder. This year’s SIAL Canada featured more than 1,000 national and international exhibitors and was attended by national and international exhibitors from 50 countries as well as over 18,500 professional buyers/visitors from Canada, the United States and other countries. Argentina, Austria, Brazil, China, Ecuador, Egypt, France, Germany, Greece, India, Italy, Jordan, Mexico, Morocco, Netherlands, Portugal, South Korea, Spain, Thailand, Turkey and UAE, were among the countries that participated at this trade event. Consul (Commercial) of the Sri Lanka Consulate General in Toronto participated at the two day Market Orientation Programme, which consisted of a Market Familiarization Tour, prior to the exhibition, in order to explore the Canadian retail markets and consumer trends, and also at the information session on the Canadian market, organized by the TFO Canada. The B2B meetings organized during the SIAL Canada exhibition ensured exhibitors to establish useful trade contacts and some of the exhibitors have already received orders for their products from the new business links made. Positive feedback was given by the exhibitors about the Market Orientation Programme and the B2B meetings arranged, and the coordination by all relevant government agencies.